“Check this out.” I listened closely as Adrian Turner queued up Poinciana by the Ahmad Jamal Trio. “It’s highly structured and orchestrated…the spaces deliberate, equal to the sounds.” In his book The History of Jazz, Ted Gioia wrote “Jamal was a harbinger of the future of jazz…his studied use of space influenced Miles Davis and anticipated the later work of Bill Evans…the charm of Jamal’s music came rather from his ability to maintain the swing, emotional conviction, and mood of his music even when playing the fewest notes.” Moments later, Adrian and his friends Darrell Morgan and Yumiko Koshima took up the bass, drums and piano, respectively, and the trio began the hard work of crafting their original compositions into a performance, inspired by the sparse, cool sounds of Ahmad’s piano and his colleagues Vernal Fournier on drums and Israel Crosby on bass (archival film footage of the Ahmad Jamal Trio in 1959 is available on YouTube). Three months later in June 2013 the trio – Adrian, Darrell and Yumi – now calling themselves Circuit M.T.G – are joined by saxaphonist Dereck Mclyn and vocalist Annabel Lee for an evening of jazz and dance called Prime Spirit at ArtShare L.A. (a sanctuary for the arts in downtown Los Angeles providing live/work lofts and spaces for performance and exhibition). 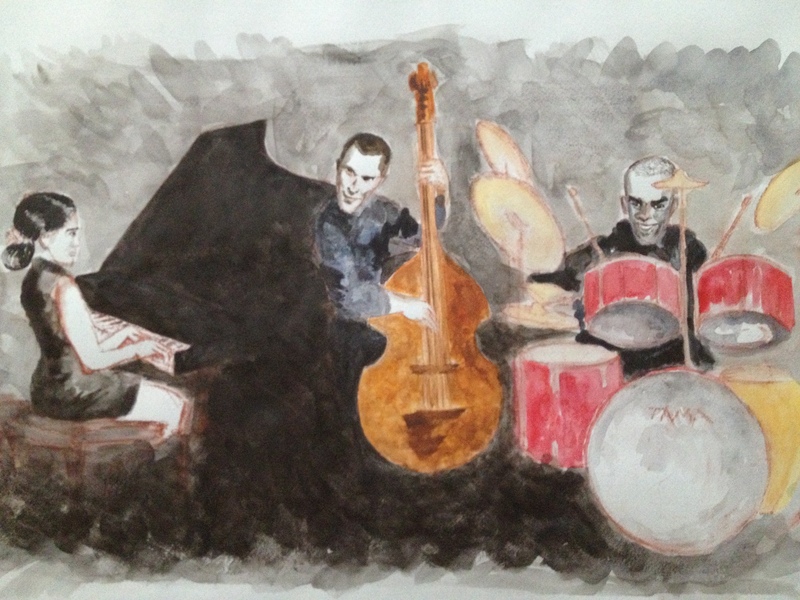 Their music is sublime; inspired, I sketch while they perform. It is a perfect evening, and I hope the music never ends; it brings me such joy to experience my good friend Adrian’s art, and although I’ve only briefly spent time with Darrell and Yumi I feel connected to them by experiencing their love for and commitment to jazz. ArtShare L.A. is near the Fashion District and a couple of blocks from South Central; the steamy hot day is coming to closure as the sun sets behind the high rises of Bunker Hill. There is historical context for jazz performance in this place. In his forward to Central Avenue Sounds, Steven Isoardi, a cultural history writer and oral historian states “from the 1920s through the early 1950s…Central Avenue, extending from downtown Los Angeles south through Watts, was the economic and social center of the black population of a segregated Los Angeles…at night it became a social and cultural mecca, attracting thousands of people from throughout southern California to its eateries, theaters, nightclubs and music venues…this nonstop, vibrant club scene produced some of the major voices in jazz and rhythm and blues and it was the only integrated setting in Los Angeles.” The book is based on excerpts from the UCLA Oral History Program’s interviews with musicians such as female trumpeter Clora Bryant (who played with Count Basie and Duke Ellington) and Buddy Collette (well known as a member of Chico Hamilton’s quintet). Looking West at the sunset for a moment I imagine the community, so vibrant in the years just before I was born, documented pictorially in Carolyn Kozo Cole’s Shades of L.A.: Pictures from Ethnic Family Albums and captured by Walter Mosley’s hero Easy Rawlins in a series of novels starting with Devil in a Blue Dress. Paraphrasing the historian Mina Yang, many factors played a role in the demise of Central Avenue: a downsizing post-WWII economy deprived many African-Americans of jobs; upwardly mobile black families were able to move out of South Central with the U.S. Supreme Court 1948 ruling making housing covenants illegal; and the merger of formerly segregated musician’s unions permitted black musicians to play in venues in other parts of Los Angeles. But for insight into the role police played in the destruction of the neighborhood read Yang’s article A Thin Blue Line down Central Avenue: The LAPD and the Demise of a Musical Hub. Swanton Berry Farm is my destination. Founded in 1989 by UC Santa Cruz graduate Jim Cochran, Swanton’s is the first commercial organic strawberry farm in California; it is also the first certified organic farm in the United States to sign a labor contract with the United Farm Workers (UFW). The farm stand, where I purchase my two pints of bright red strawberries, proudly displays the UFW flag bearing the black eagle on a field of red. The UFW was formed as a result of Cesar Chavez’s organizing of Mexican-American and Fillipino American farmworkers to engage in boycotts, hunger strikes and strikes (all based on pacifism) to gain their rights. The successful 1965 Delano grape strike is the most famous effort. 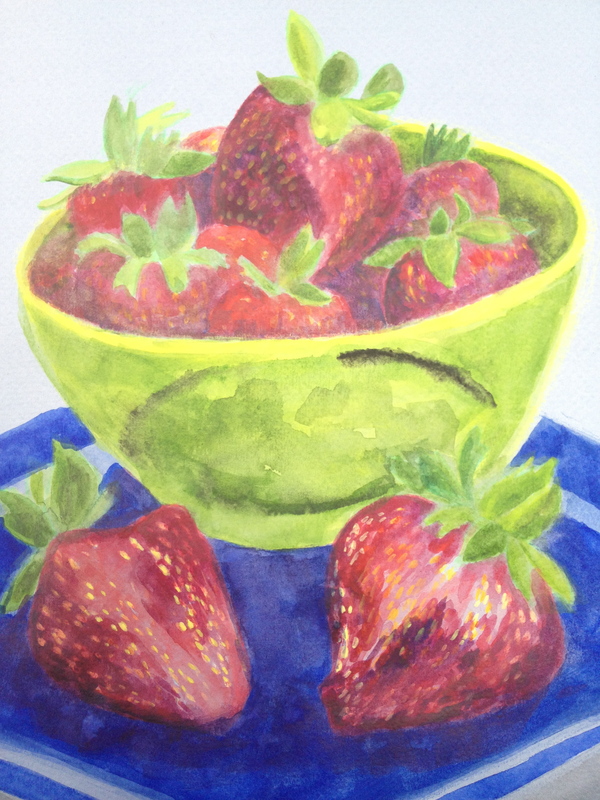 The strawberries are amazing; a delight to see, smell, and taste the sweet and tart delight grown in the sandy soils of the coastline routinely kissed by the sea air. Last year, when Irene Reti’s & Sarah Rabkin’s oral history Cultivating a Movement was published, I read about Jim Cochran’s sustainable practices. Jim described using the Brassica family of plants— broccoli, cauliflower and mustard greens— in crop rotation to improve soil health instead of traditional strawberry farming practices using methyl bromide and Chloropicrin to kill soil disease. At Swanton’s you will never see the plastic covering the fields of commercial growers, indicating chemical fumigation is underway. This month is also the 38th anniversary of the California Agricultural Labor Relations Act that became law on June 5, 1975 giving farm workers the right to collective bargaining and ensuring “peace in the agricultural fields by guaranteeing justice for all agricultural workers and stability in labor relations.” The act allowed union organizers to meet with farm workers in the fields and for farm workers to select representation by unions such as the UFW to engage in collective bargaining to negotiate conditions of employment. 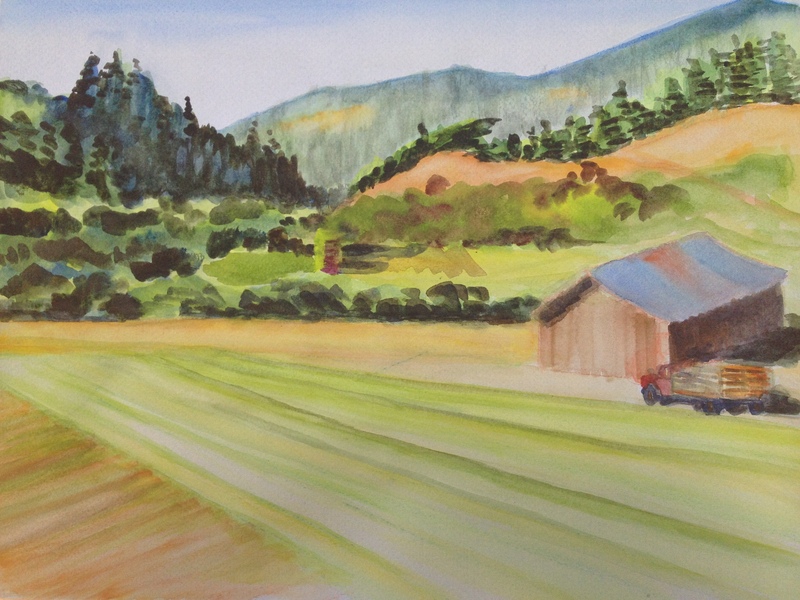 After purchasing my strawberries, I drive out Swanton Road a beautiful loop curving through the Swanton Pacific Ranch, crossing Scott Creek a riparian corridor for Coho Salmon and Steelhead Trout, and winding through forests of Redwoods, Douglas Fir, and Monterey Pine. Surfers say the waves where Scott Creek estuary greets the ocean are the same as Swami’s Beach in San Diego County. The Ranch is beautiful. The furrows nestled amongst the coastal ecosystem; mankind’s geometric abstractions seeking to tame the wilderness topography. Recently I learned about the plein-air painter Sheridan Lord whose inspiring works are with us in the book Things in Place. Sheridan’s farm paintings are pictures “of breathtaking simplicity: the whole surface is occupied by the towering sky and broad fields, which are separated by a mere strip of trees.” Lord’s paintings evoke the environmental writer Peter Matthiessen who quotes the Ojibwa people in his book Nine-Headed Dragon River writing “sometimes I go about in pity for myself, and all the while a great wind is bearing me across the sky.” Mindfulness is found in many ways: in a song, in a vista, in a painting, in a koan, or in a strawberry.